As part of our celebration of National Poetry Month, we're featuring the work of a wide variety of poets. Today, we're taking a closer look at the work of Basho. Born in 1644 near Kyoto, Japan, Matsuo Kinsaku, later known as Basho, gained his early appreciation for literature while in the service of the son of a local lord. 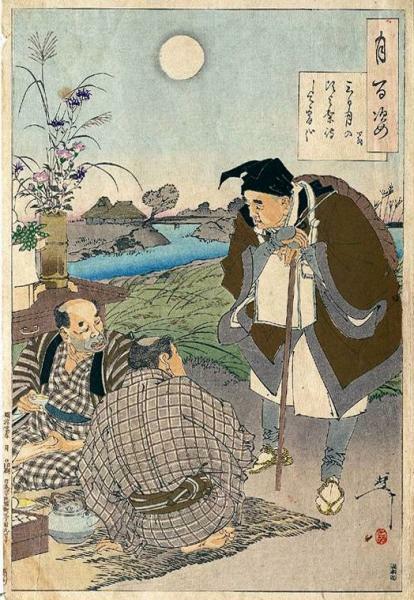 While his brothers became farmers, Basho moved to Kyoto to study poetry with Kigin, a local poet of some note. He also studied Chinese poetry, and began to write his own works in a style called haikai no renga, a series of verses, thematically linked, composed in collaboration with other poets that are . The first section of a haikai no renga poem, called a hokku, is a short verse of three lines, alternating five and seven syllables. As Basho began to create his own works, other poets were beginning to use the hokku style to create short verses evoking images of nature, a style that eventually became haiku. Basho quickly proved himself a master of this new style. He joined the burdgeoning literary community in Edo where he continued to write and publish his own work, as well as editing several anthologies of poetry. He also created a new poetic style, called haibun, which combines verses of poetry with fragments of prose to describe the course of a journey. Though he wrote several of these haibun, his most famous was Oku no Hosomichi, or Narrow Road to the Interior, which documents the 1,200 mile journey Basho undertook with his student, Sora. The route they took was something of a literary highlights tour, taking them to visit locations described by earlier poets. Basho melded these earlier works with his own, crafting the haibun he would continue to edit until shortly before his death in 1694. Oku no Hosomichi was first published in 1702, and since then this, and many more of Basho's works, have been republished and translated to be enjoyed by readers around the world.